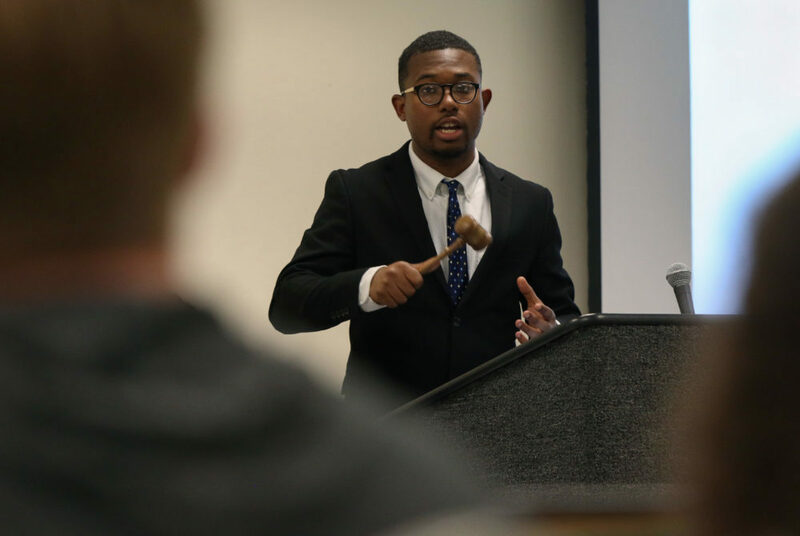 SA Executive Vice President Ojani Walthrust speaks to the senate during a meeting Monday. The Student Association Senate confirmed nine positions Monday. The SA Senate approved six students to serve in the senate and four other students to take on roles in groups like the diversity and inclusion assembly and governance and nominations committee. One of the roles will be filled by Imani Ross, a former SA senator and candidate for SA president, who will return to the SA as the chief policy director for Executive Vice President Ojani Walthrust. The senate did not pass legislation during the meeting, but senators did question SA President Ashley Le about her appointment of eight students to Faculty Senate committees without senate approval. The act violated the organization’s bylaws.